The 2018 Toyota Camry is another vehicle that has received a total makeover this year. Now, there are three new powertrains and a distinctive body design helping it stand out from the crowd. There’s only one issue, which one will you choose? 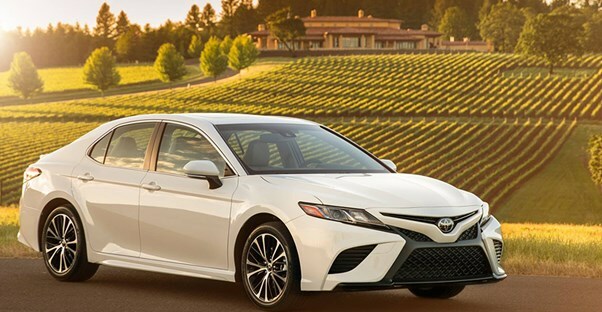 At $23,495, the 2018 Toyota Camry L is the least expensive option, making it an excellent choice for the budget conscious car buyer. It features a 2.5-liter four-cylinder engine and gives the driver up to 29 mpg in the city and 41 mpg on the highway. That’s some of the best gas mileage on the market without upgrading to a hybrid. If you’re concerned about features on the inside, the L comes with Entune 3.0 Audio with Connected Navigation. This includes Bluetooth technology, an auxiliary audio jack, and a USB 2.0 port. Music is played through six speakers located throughout the cabin. This trim also comes standard with an integrated backup camera with projected path to help you back into even the smallest of spaces. Finally, for safety, the Toyota Camry L uses a safety star system, which includes Enhanced Vehicle Stability Control, Traction Control, Four-Wheel Anti-Lock Brake System, Electronic Brake-force Distribution, Brake Assist, and Smart Stop Technology. The LE doesn’t cost much more than the L with a starting MSRP of $24,000. The biggest difference is that there is an anti-theft system, which can help protect your investment. Another upgrade is the addition of two rear cup holders to accompany the two front. While this may seem like a small inclusion, it’s the difference between a stained backseat and spotless fabric. If you want more features and something more environmentally friendly, the LE comes with a Hybrid option that costs $27,800. The hybrid adds heated front seating and Smart Key system, but what really stands out are the safety features. The LE Hybrid has collision sensors that deactivate the battery in the event of a crash, a Blind Spot Monitoring System, and a Tire Pressure Monitor System with direct pressure readout. As for mileage, the hybrid LE gets up to 51 mpg in the city and 53 mpg on the highway. The SE starts at $25,200 and has a bit of a sportier feel when compared to the LE. It has some cosmetic changes, but drivers can feel the difference in the cabin. Toyota crafted the seats with Sport SofTex fabric, a synthetic leather that’s soft to the touch while reflecting the sun to reduce the heat in the summer months. Since the SE uses the same engine as the LE, it has the same fuel economy. If you love the SE but wish you could get better gas mileage, you can upgrade to the SE Hybrid, which starts at $29,500. The fuel economy for the Hybrid SE comes in at 44 mpg in the city and 47 mpg on the highway. While it keeps the SE upgrades, the SE Hybrid includes all of the safety and convenience features from the LE Hybrid. The XLE starts at $28,450 and is much more luxurious than previous trims. Drivers may immediately notice the addition of heated, leather seating along with Tiger Eye wood trim. The backup camera improves thanks to the addition of dynamic guidelines that predict where you will end up. The XLE is the first non-hybrid trim that introduces a Smart Key System. The XLE comes in two other versions including the Hybrid and the XLE V6. The Hybrid increases the price to $32,250 but comes with the same safety system as the Hybrid LE. The Hybrid XLE fuel economy is estimated at 44 mpg in the city and 47 mpg on the highway. The XLE V6 starts at $34,400 and is perfect for someone who wants a little more power. It comes with a 3.5-L V6 that’s capable of 301 horsepower and 267 lb.-ft. of torque. The gas mileage does drop to an estimated 22 mpg in the city and 33 mpg on the highway, however. The XLE V6 comes with other cosmetic changes that make it look a little sportier. These include LED taillights with smoke tint and a bright metallic front grille. The 2018 Toyota Camry XSE starts at $29,000 and looks very similar to the XLE with one small exception: a slighty different engine. It comes with a 2.5-liter Dynamic Force engine that’s capable of 206 horsepower and 186 lb.-ft of torque. That's only a mere 3 horsepower more than the XLE. The body also has exterior changes that give it a sporty feel, including the addition of LED taillights with smoke tint, a gloss-black grille with sport mesh insert, and color-keyed sport side rocker panels. If you want more power, the XSE has a V6 option that starts at $34,950. This drops the gas mileage to an estimated 22 mpg in the city and 32 mpg on the highway but increases horsepower to 301 with 267 lb.-ft. of torque. The XSE V6 also comes with a panoramic glass room with power tilt and slide.